Additional storage can be built underneath the staircase. The number of vehicles you plan to park in your garage, and the size of each vehicle, is another thing to take into consideration when planning your new garage. Fortunately, today’s garage doors come in a variety of different sizes depending on your needs. Standard single garage doors accommodate most vehicles, but those with larger SUVs, trucks, and recreational vehicles like RVs and campers, may need larger sizes. If you need room for larger vehicles, or would like to fit multiple vehicles within the space, consider a double garage door model, which are available in larger sizes such as 14 x 7 feet and 16 x 7 feet. Those with recreational vehicles may need to go even bigger. Our team can help you design a custom garage and choose the right door to fit your specific vehicle needs. Another option to consider is installing a high lift garage door or a overhead door pitchback. Both options allow for the garage door to be lifted much higher off the ground, freeing up ceiling space within your garage. This is especially beneficial for those hoping to install a car lift, a device that allows one car to be raised off the ground and another parked underneath it. For those with only enough space for a single door garage, a lift can be a great way to fit two cars in a limited space. 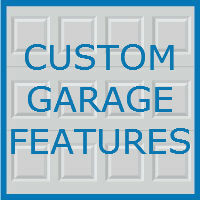 Check out our custom garage gallery for examples of high lift garage doors and pitchbacks we have installed. Are you ready to have the perfect garage? If so, contact the team at Blue Sky Builders to get started today. Our team is here to help with every step of your next garage project, from demolition to rebuilding to installing custom features to fit your needs. Call 630-852-8485 or visit Blue Sky Builders online now.